Reduced IRF8 expression in macrophages associates with an enrichment of metastasis-associated genes. Transcriptome analysis of BMDMs from WT (n = 2 biologic replicates) or IRF8-cKO (n = 2 biologic replicates) mice after treatment with IFN-γ (100 U/ml for 24 hours) to maximize IRF8 induction. (A) GSEA for positively enriched genes in BMDMs from the IRF8-cKO model. NES, normalized enrichment score. (B) Overrepresented biologic processes showing genes upregulated in BMDMs from IFN-γ–treated IRF8-cKO mice compared with the IFN-γ–treated WT controls, as determined by gene ontology (GO) analysis. 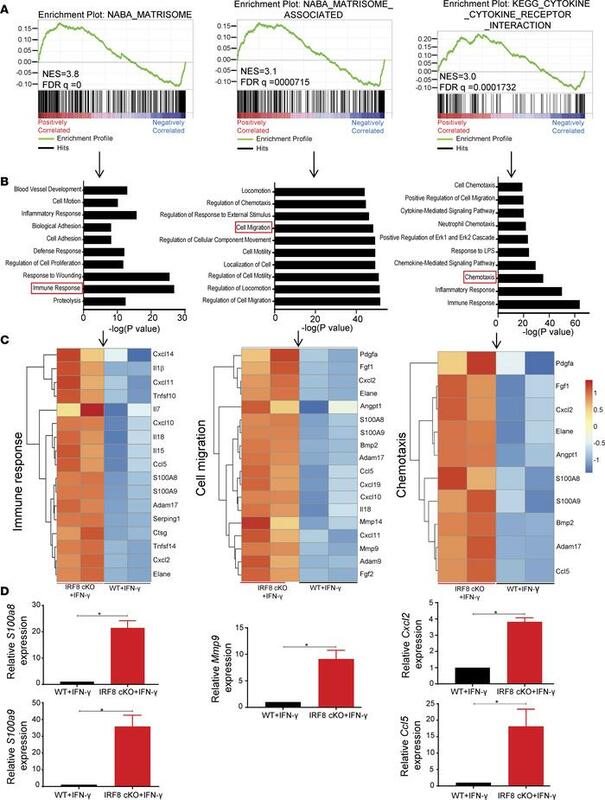 (C) Heatmaps depicting a subset of upregulated genes involved in immune response, cell migration, and chemotaxis (as boxed in B) of BMDMs from the same groups in A and B. Full heatmaps can be found in Supplemental Figure 9. (D) Validation of the indicated genes by qPCR analyses (mean ± SEM of 6 replicates pooled from 2 biologic or independent experiments). Statistical analysis was determined by a 2-tailed Mann-Whitney U test. *P < 0.05.